A lot of people mistake Spirituality for Religion or some mysterious, supernatural occurrence. Some even think of it as a sect but this is because of their lack of knowledge and their fear of being manipulated. 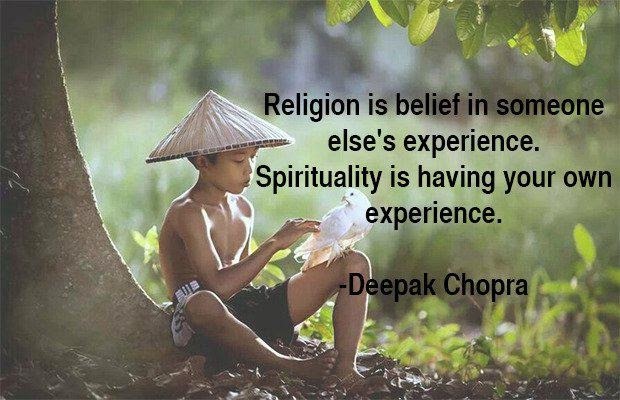 If we move past this and try to study and understand what spirituality actually is, we’ll come to a realization that it is nothing mysterious or supernatural nor in any way connected to a sect of any kind. These 7 differences between Religion and Spirituality will help you understand what Spirituality actually is. Religion tells you what to fear and tells you consequences. Spirituality makes you aware of the consequences but doesn’t want you to focus on the fear. It shows you How to Stand Despite Being Afraid, how to move on doing what you feel it’s right despite the consequences that may come. It shows you how to act on love and not on fear, it shows you how to control fear and use the best of it. Religion tells you what to believe and what is right. Spirituality lets you discover it by yourself and understand it in your own unique way. It lets you Connect With Your Higher Self and see with your own mind what truth is because the truth as a whole is same for each one of us. It lets you believe in your own truth through your own perception of your heart. If you attend religious events only then you are seen as a religious person and someone who is worthy of happiness. Spirituality shows you that you don’t need or depend on anything to be happy. Happiness is always found deep in ourselves and only we are responsible for it. We are always where we need to be and not just while attending at some events or buildings. Divinity is in us and that is why we are always worthy. Religion says that if we don’t obey certain rules there is punishment that awaits us which relies on our belief. Spirituality lets us understand that every action has its reaction and realize that the punishment of our actions will be the reaction coming from the actions we set in motion. It relies solely on the fundamental forces of The Universe and it doesn’t need you to believe in that force to be true. The foundation of one religion is the story it tells about a God or Gods, their journey to enlightenment and the truth they have discovered making you follow their steps. Spirituality lets you Walk Your Own Journey to Enlightenment and discover the truth in your own way following what your heart tells it’s right because the truth is always the same no matter how you get to it. Every religion came by spirituality, by the journey through which one person became God. The details of the story are not important they just help the character discover the truth. The message that shares the truth is what is important, The Divine Code of The Human Heart that resonates harmoniously through each of us. That is why every religion has something true in it, the truth.